Electronic Gas Sensor AXLR FR from SATT AxLR on Vimeo. 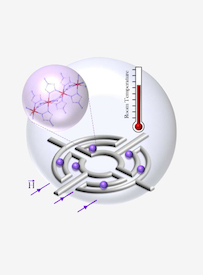 Implementation of an ultra high-performance hybrid sensor operating at room temperature and combining magnetic sensivity and bistability of spin transition material on a nanometric scale (« gas sensor » nanomaterials). 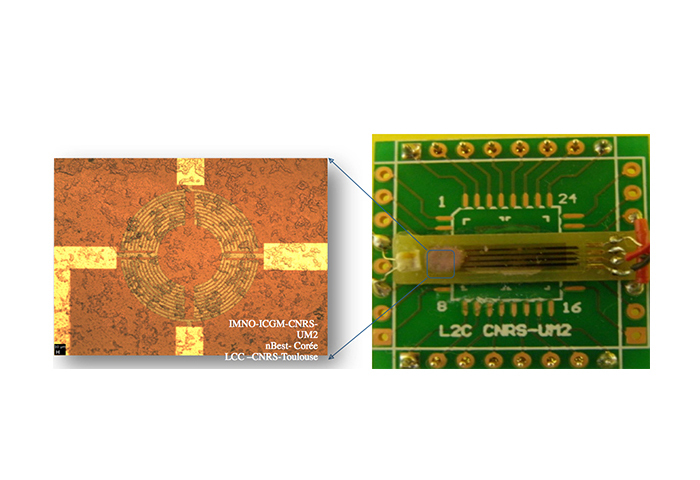 The technological innovation offered by this project is based its ability to integrate the sensor mechanism into electronic systems, leveraging its miniature (micro/nano) MEMS architecture and high detection sensitivity at room temperature to achieve a high level of gas selectivity as well as a very low detection threshold. 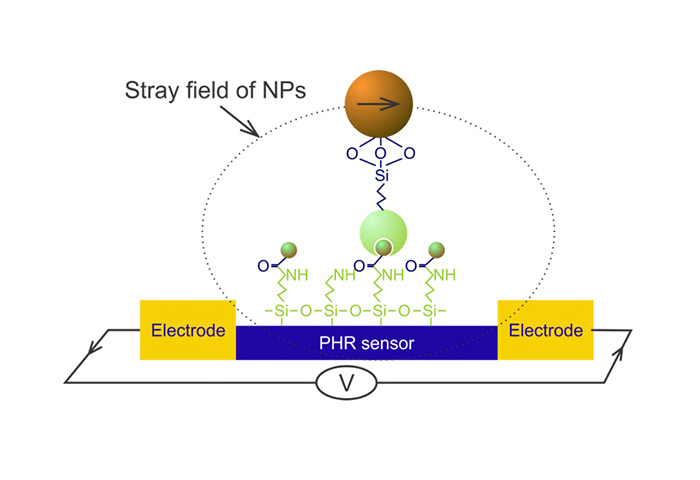 The sensor’s innovation and originality resides in the intrinsic coupling of an ultra-high-performance magnetic mechanism (nonTesla, femtomol) and molecular materials that are highly sensitive to the immediate environment and external physico-chemical parameters such as pressure, temperature, light, electrical fields, and magnetic fields. 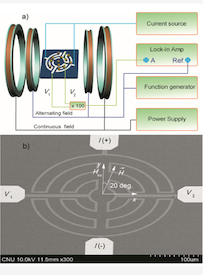 We have developed a new measurement method based on creating hybrid magnetic sensors that use the planar Hall effect to detect the spin transition of bistable magnetic materials. Different types of ambient gases may be detected by changing the composition of these molecular materials, integrated inside the magnetic sensors. Detected gases include greenhouse gases, inflammable vapor, toxic vapor, oxygen, hydrogen, or benzene and its derivatives. Schematic picture of the micromagnetometry device for (photo-)magnetic studies on a single object. a) High sensitive experimental setup developed for the study of (photo-)magnetic nano particles. 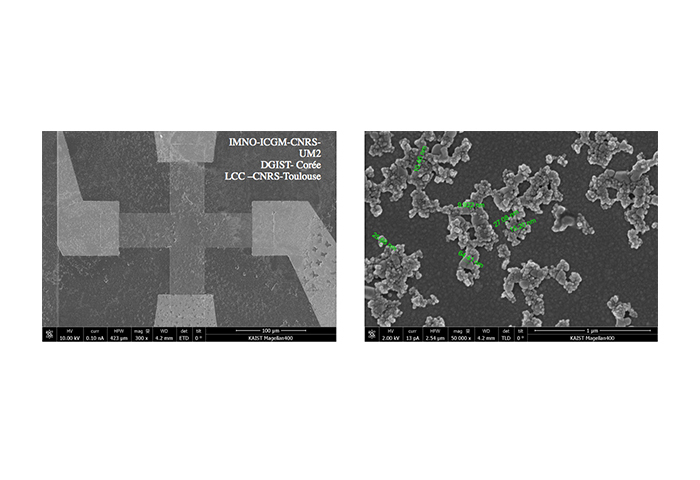 b) The SEM image of a sensor junction. Able to detect tiny concentrations of a wide range of gases (<10-12 mol). The system combines the sensor’s electromagnetic sensitivity (10-9 Tesla) with the chemical sensitivity of nanoparticles in spin transition. 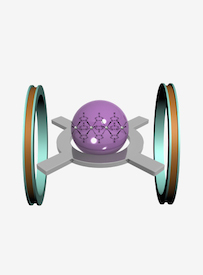 Ability to detect several gases simultaneously in three dimensions. Ability to use this solution for both fixed and mobile applications (portable detectors). In addition, the sensor may be placed on flexible structures (angles, …) enabling numerous usage scenarios. Whereas most currently available instruments used for detecting magnetic transitions on nano-materials (micro/nano SQUID mechanisms) only operate at cryogenic temperatures (~30K to 50K), the solution developed by this project may be used at room temperature as well as in a very wide temperature range (-200°C to 420°C). 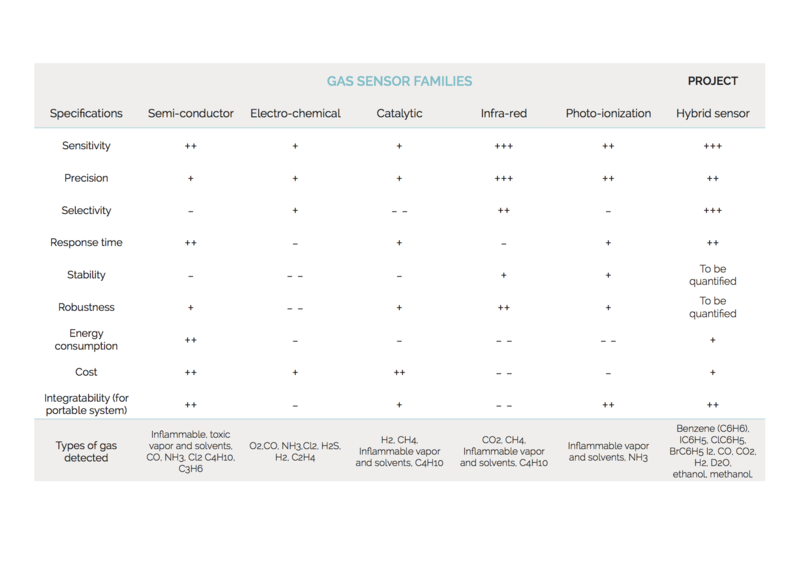 Main properties of the hybrid magnetic gas sensor compared to the main families of existing gas sensors. Seeking industrial sensor integrators for applications to detect very low concentrations of gas. AxLR is a technology transfer acceleration company. Our specialty is helping innovative projects derived from academic research reach maturity and commercialization. We work with the main public-sector research laboratories in France’s Languedoc-Roussillon area, one of the most dynamic locations in Europe, with over 200 laboratories and some 12,000 researchers.